Chow Chow Dogs - Chow Chow, or Chow, is a breed of dog originating from Mongolia and Northern China, where it is referred to as Songshi Quan, which literally means "puffy-lion dog". The Chow Chow is a medium sized stocky dog with broad skull and small, rounded ears. The breed has a very dense coat that is either smooth or rough. The fur is particularly thick around the neck, giving the distinctive ruff or mane. The coat may be one of several colors including reddish-brown (described as "red"), black, blue, cinnamon, and cream. Chows are distinguished by their unusual blue-black/purple tongue and very straight hind legs, resulting in a rather stilted gait. The blue-black/purple tongue gene appears to be dominant, as almost all mixed breed dogs who come from a Chow retain the tongue color. While commonly kept as a companion dog, the Chow has a reputation for being a willful and independent breed that is sometimes difficult to train. They may be very aloof and wary of strangers. They often do not get along well with other dogs unless properly socialized. 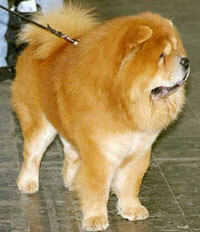 Chows are extremely loyal to their own family, though they may be less friendly to strangers. The typical Chow's behavior is commonly thought to be more similar to a domestic cat rather than a domestic dog. This information is licensed under the GNU Free Documentation License. It uses material from the Chow Chow article on Wikipedia.org. Chow Chow Breeders - Advertise your kennel puppies and dogs here.